Some people think of Dietitians as the healthcare professional that is going to take all the fun out of life. We’re going to advise you to eat carrots, when everyone else is eating cheesecake. That is not how I practice. Even when I taught a higher carb style of eating, I always believed there were “everyday foods” and “sometimes foods” and never believed in forbidding any food (unless serious food allergies were involved). For me it’s always been about how much and how often we eat something. If you’ve been following my blogs for a while, you know that I don’t believe in eating unlimited amounts of any type of foods or restricting any food groups. Yes, I recommend people eat carbs in vegetables, nuts and seeds, certain dairy and some fruit and legumes, if tolerated. Protein is adequate, but not in excess. 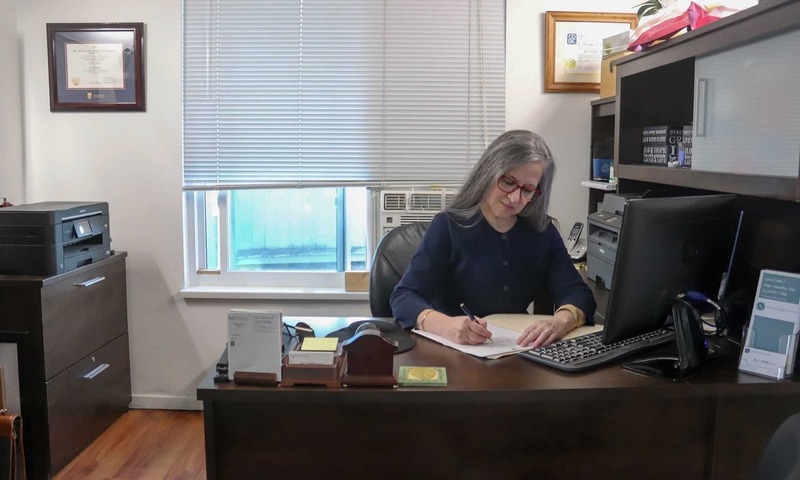 I encourage eating a wide range of healthy fat, including that found in the protein sources, as well as monounsaturated fats such as olive oil and avocado oil, as well as using coconut oil to raise the smoke point of those, when heating them to higher temperatures. But what about sweets? Where do they fit in? I do think there are times where celebrating a special occasion warrants making something special that contains carbs, fat and protein beyond what we usually eat. I am not the Grinch of holidays or celebrations! I encourage people to plan for eating the treats by knowing the macronutrient content in it (amount of protein, fat and carbs in grams) and subtracting that from their Meal Plan ahead of time. This rarely necessitates people eating more than they usually do because the foods themselves, if well planned, can take the place of a meal. 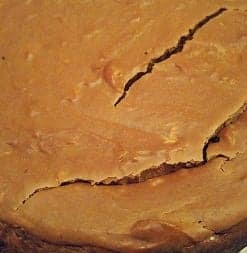 If it means that someone eats “Pumpkin Pie without the Pie” (crust-less low carb pumpkin custard) instead of supper, so be it! The net carbs from the pumpkin itself minus the fiber aren’t that high, and the eggs and cream inside the custard filling serve as the protein source for the meal, and the rest is fat. So? What’s wrong with that? Tonight is one of those occasions that a special treat was warranted. 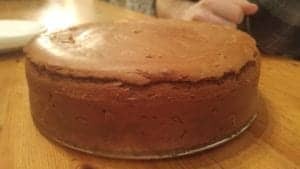 One of my sons has been wanting New York style cheesecake since he began eating low carb high healthy fat with me, 7 months ago and today I baked him one! 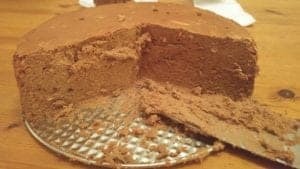 It is creamy and rich with all the mouth-feel one expects from New York Cheesecake from the cream cheese, egg and egg yolks. It has real Swiss dark chocolate and homemade vanilla extract, made from real vanilla beans soaked in Russian vodka. It has a little hint of sweet, because after all, it is for a special occasion! Should he choose to (or rather if he were even able to) he could eat the entire 8 1/2″ cheese cake and not exceed his daily 100 g of carbs! I can assure you, he will try! And who could blame him? 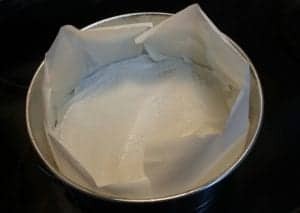 Prepare an 8 1/2 ” spring-form pan by lining with parchment paper and spraying well with an oil spray. 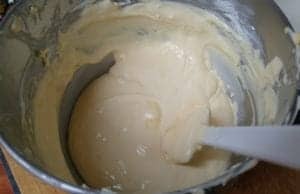 In the bowl of a stand mixer using the flat paddle or by hand, beat the cream cheese until very well blended and add the eggs one at a time, continuing to blend. Add the egg yolks, then the salt, berry sugar (castor sugar) and real vanilla. 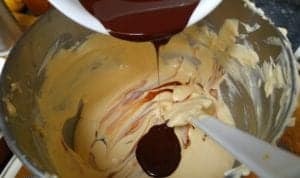 Remove the bowl from the stand mixer and fold in the melted, cooled chocolate. Bake at 500 F for 12 minutes, then lower the heat to 200 F and make for another 45 minutes. 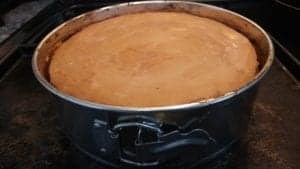 Turn off the heat of the oven and open the door, but leave the cheesecake inside for 30 minutes until partially cooled. Then move it to a draught-free location to completely cool.